This is a summary of an article from the Bord Bia website which reports on the Food Loves Tech Conference in the US in November 2018 which had demos of how robots can be used in the foodservice industry. 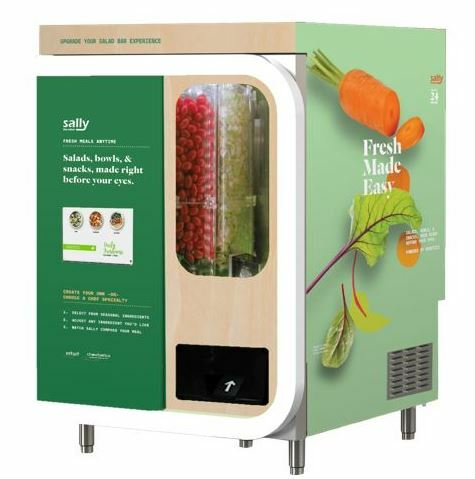 It reported on innovations such as how food businesses can grow salad greens in-house in water only and also new initiatives to deal with the problem of food excess. At the conference, there were demonstrations of how robots can be used in the food industry. Sally the Robot demonstrated how made-to-order salads, breakfast bowls and grains could be served by a robot from canisters which are pre-loaded with each of the food elements. Similarly, visitors to the conference were able to see a robot making cocktails. Other ideas at the conference related to the issue of food waste. Panellists at a discussion of suggested renaming this issue “food surplus” or “food excess” to make it more appealing to consumers. Recent innovations by some food companies to reduce food waste were discussed, such as the Food for All app, which allows consumers to order food at a 50% discount just before restaurant close to help reduce closing time food waste. Other innovations Spare Food Company which encourages chefs to create new recipes out of food excess. Hydroponic agriculture is the practice growing food in water, rather than soil. This innovation plus others like it allow food companies quicker access to fresh salad green greens. Some of these other innovations seen at the conference included growing salads in urban, rooftop greenhouses, growing plants vertically to save space, under LED lights and in water only.